According to the legend, when Buddha reached enlightenment he invited all the animals to celebrate their joy. To that invitation only 12 animals came, among them the Rabbit, and they all obtained, as a prize, the inclusion in the Chinese zodiac. How do I know if I am a Rabbit? As we have indicated before, each animal ‘governs’ a specific year. 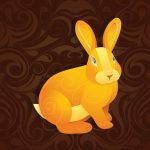 The years of the Rabbit in the Chinese Horoscope are: 1903, 1915 1927, 1939, 1951, 1963, 1975, 1987, 1999, 2011… and thus consecutively adding 12 years to the previous figure. In the Chinese Horoscope the Rabbit is intuitive, sensitive and creative. People born under this sign are empathic with the pain of others and try to do everything in their power to mitigate it. They like to see truth and justice prevail, and when that does not happen they feel deeply hurt. In general, they are good communicators, but they know how to keep secrets when the situation demands it. Intuition: those born under the sign of the Rabbit in the Chinese Horoscope are intuitive although sometimes it is difficult for them to trust their own perception. This ability makes them feel attracted to the world of clairvoyance and the occult sciences in general. Honesty: they have a great sense of honesty with themselves and with others, but at the same time they demand this type of behavior from others. Sensitivity: people born under this sign of the Chinese Horoscope are extremely sensitive and it is very easy to hurt them, specially in the love field. Quietness: in general they act slowly, meditating on decisions, paying attention to different situations. If the Rabbit itself is characterized by being intuitive and sensitive, when it is influenced by the water element these characteristics multiply by two. Sometimes, when they do not feel safe, they are given to irrational fears which makes them want to isolate themselves but they only need a little security to get out of that state. People with the influence of this element are usually the prototype artist we all have in mind. This sign of the Chinese Horoscope is extremely good doing everything that allows them to bring out their emotions and put them to the limit. The characteristic empathy of the Rabbit becomes under the fire element in a way of life. With a strong social conscience, he actively struggles to try to end the injustices that surround him, however small they may seem. The earth element gives them a pragmatism and an unusual realism. People born under the Rabbit with influence of the earth are those who set small goals to achieve the big ones. They never leave anything half done. Those born under this sign of the Chinese Horoscope are ambitious people, with a lot of courage and a lot of perseverance. All this, added to their perseverance, makes them achieve any goal that they propose.